For more information about our Through Hole Assembly and Technology click here to contact us. One popular PCB option that AMS Electronics offers to meet your electronic manufacturing needs is through hole assembly technology (THT). This technology provides a strong mechanical bond increasing the mounting strength of the components. Various reason for using through hole technology could be the size and shape of the component, the placement of leads, or the sensitivity and stress of the component. Although older and more expensive than Surface Mount Technology (SMT), it may be a reliable, powerful solution to you printed circuit board pursuit. We will be happy to work with you to determine the best technologies for your particular project. At AMS our through hole components are placed in our facility either by hand or by one of our three Contact Systems CS-400 semi-automatic component locator machines that facilitate repeatable, process-controlled builds. AMS also utilizes state-of-the art component prep equipment that supports our highly flexible manual insertion lines. Wave soldering further complements our through hole assembly processes. Our selective soldering process enables AMS to be completely RoHS compliant with dual lead-free and leaded capability. With the low turnover rate at AMS you can be assured that the soldering of your through hole components will be handled by highly experienced operators. This experience increases the efficiency and quality which makes AMS the first-choice supplier. More About Through Hole Assembly. What exactly is through hole assembly? 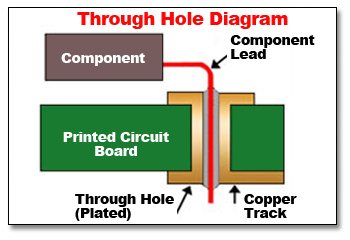 There are two basic methods for mounting a component to a printed circuits board, the first is called surface mount assembly (click here for more information) and the second method is called through hole technology (abbreviated "TH"). While a surface mount literally affixes the component to the top surface of the board, through hole attaches the component to the board by providing holes in the board to allow the component lead to go through the board and exit the opposite side of the board. From here the leads are soldered to the copper track completing the circuit. There are many reasons why through hole technology is used over surface mount including the size and shape of the component, the placement of leads, and even the sensitivity and stress of the component.